Got kids? Then we’re fairly certain video games are part of your life. And though gaming is fun and engaging, we all know that we, as parents, have to watch out for our kids playing the wrong type of games. In fact, every year games get more realistic and, in some cases, more violent. So what happens when you can’t be there to add your two cents? That's where parental controls take over. Parental controls help you restrict access to games based on their content rating. They also help you keep a handle on other potential problem areas, such as web browsing, chat and purchases (Nintendo Wii, Sony PlayStation 3 and Microsoft Xbox 360 have online stores for transactions like buying games and renting movies). 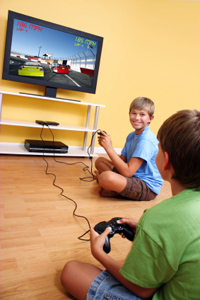 All three major video game systems offer some level of parental controls, protected by a password or code. 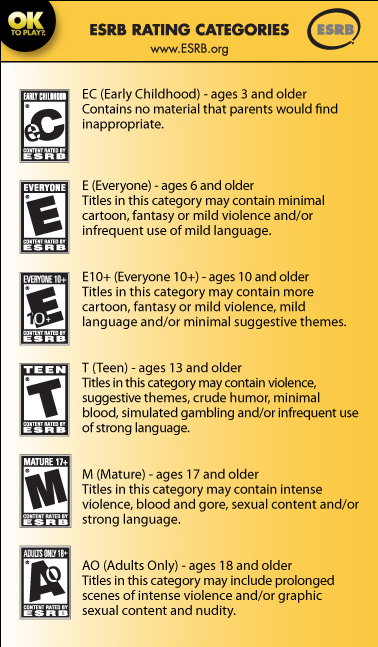 The ESRB (Entertainment Software Rating Board) put together these great instructions for setting up parental controls on each of the three games systems. 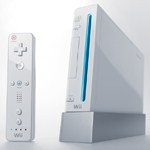 Or check out the information provided by the manufacturer: Nintendo Wii, Sony PlayStation 3 and Microsoft Xbox 360. Before you buy, you should make sure the games are appropriate for your child’s age. Each system has games that are intended for certain age groups, and rated by the ESRB (Entertainment Software Rating Board) system. The packaging for each game will show the rating clearly on the front, with an exact listing of the sort of content found within the game printed on the back. Check out What They Play for descriptions of how ratings for things like violence play out in a game. And if you haven’t already, start reading these ratings on your kids’ current games and on any future games you might buy. Once a game comes through the door, parental controls on the game consoles let you manage what your kids are playing by setting restrictions according to these ratings. Movies can also be restricted by rating. And be sure to check all downloadable content, like games and videos, which may not be rated. All three consoles can be set up to connect to the Internet— whether to surf the web, play multiplayer, online games or chat and receive messages. So how do you make sure your kids don't browse to off-limit sites or use other online features inappropriately? All the consoles let you simply turn the Internet access on and off. If you decide to leave it on, Xbox and PS3 also have controls that let you manage how your children use the online features. Xbox 360 uses a service called Xbox Live for multiplayer gaming and social networking, which requires an annual subscription fee ($70). It doesn’t have a browser, and its newer features, such as Facebook and Twitter, can only be set to on or off. When it comes to chat, the default parental control is “friends only,” so kids can only communicate with an approved list of other kids. The PS3 has a browser that uses its free PlayStation Network service. Parents can activate a subscription to Trend Micro Web Security for PS3 ($19.99), which will block harmful, fraudulent and other malicious websites, and Trend Micro Kids Safety for PS3 ($19.99), which prevents children from browsing to websites that are unsuitable for them . (Purchase both for $34.99.) Sony also allows parents to block all chatting activity or block individuals. Kids can only receive invitations to chat from people on their Friends list. Nintendo Wii just lets parents turn Internet browsing on or off. There are no other choices. And when it comes to chat, Wii only allows communication if two players have exchanged “chat codes,” which are different for each game. For Xbox Live Marketplace, you can prevent access to content by rating and require a pass code to make purchases.